Southeast Floor Prep is your Florida concrete Specialty Floor Coating expert. An excellent corporation, the name has become an inadequate description of the abilities of the business. A growing company constantly expanding its abilities, at SFP we pride ourselves in not only providing quality floor preparations but now specialty floor coatings as well. 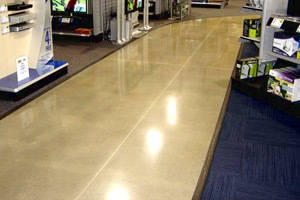 Car dealerships to government entities have enjoyed the restoration of concrete floors and walls, providing an elegant brand new look to every concrete structure refinished. Since 2005 SFP has been refinishing concrete in Florida. Those that have concrete surfaces in the state understand the havoc the environment can play upon the finish. Once beautiful new slabs of concrete (walls and floors), not too many years go by and pits, cracks, and ultimately rust (yes, concrete contains steel reinforcements) destroy what was once a solid and fine looking surface. Our professionals will come to a location and prepare the surface and then are able to immediately refinish a surface in a variety of ways. We have been able to completely refinish as much as 15,000 square feet in a single weekend. Specialty floor coatings creating the appearance of a brand new concrete floor and extending concrete life, this of course eliminates the need for the replacement of concrete structures that are deemed, one day, unsafe. For those who are familiar with the escalation of concrete prices, we do not need to explain, this is a very expensive proposition. We at SFP embrace the challenges that concrete provides. At every adversity has come increased abilities and we have yet to meet the concrete structure we could not beautify. Let’s face it, Florida is tough on concrete. Specialty floor coatings provided by SFP hides that fact in ways only quality experience and a desire to please can provide. Concrete stained floors are great flooring alternatives when you are tired of traditional carpet, tile or wood flooring. Concrete stained flooring provides unlimited coloring options including warm earthy tones and vibrant hues. Our professional Florida concrete stain services allow you to customize the coloring of your concrete floors to match the interior of your home. Did you know that all concrete surfaces, new or old, inside or outside of the home can be stained? If you are considering stained flooring, call the experts at Southeast Floor Prep for a concrete stain that will enhance your home and last for years to come! The majority of people in South Florida who are thinking of a floor coating or paint for their garage usually imagine a boring battleship grey color. At Southeast Floor Prep, our Florida Concrete Specialty Floor Coating specialist offers high quality specialty floor coating services for your garage floor or other concrete. If you want to have a garage that looks better because you want to sell it faster or you really like to own nice things, then this grey color cannot do anything for you. The bare concrete is already grey so why even bother touching it up? Well, if this is your way of thinking, then you are in great luck. Now, you can have an epoxy floor paint in more colors than you ever thought possible. You don’t have to just “let the floor go.” You can make it look just as nice as the rest of your home. Putting an epoxy paint on the floor of your Florida garage will make it feel like another room in your home as well as protect it from any future damage, scratches, or wear and tear for years to come. If you are looking for a Concrete Specialty Floor Coating Company in South Florida then please call toll free at 1-877-GRINDFLOOR (1-877-474-6335) or locally at 561-748-7754 or complete our online request form.